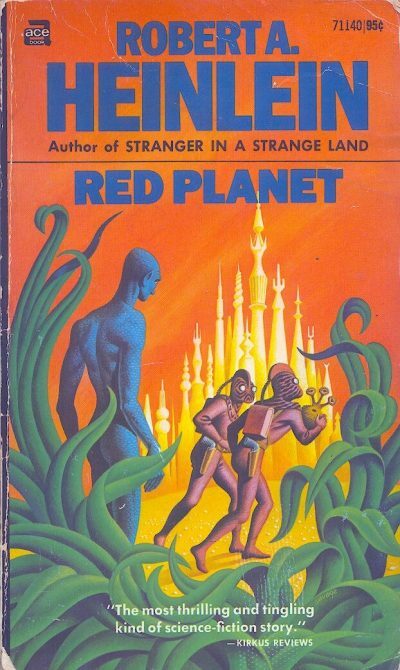 1949’s Red Planet takes us to a Mars far more habitable than the real one, an inviting if challenging world whose ancient civilization seems to have little issue sharing Mars with a handful of human colonists from Earth. Changes are coming for the colonists, changes that will cast a stark light on the assumptions the humans have about their hosts. Jim Marlowe and his close chum Frank are just on the edge of being adults, old enough to carry side-arms and about to be sent off to boarding school near the equator but young enough that Jim really, really does not want to leave his pet bouncer Willis behind, particularly since there is some chance that the bouncer’s poorly understood life-cycle will forever part the two. Jim decides to take his pet with him and that decision triggers an entire cascade of consequences for Jim, his family and friends and potentially the entire human race. Boarding school proves less fun than had been anticipated; the new school master, Howe, is a martinet fresh from a military academy on Earth, a fellow who qualifications are less that he is good at his job and more that he is the nephew of the head of the Company that sent the colonists to Mars. Regulation follows regulation and Jim proves to have a particular talent for angering Howe. Worse is to come: Howe covets Willis and the process of recovering the bouncer reveals that the Company has plans to utterly change the colonist way of life the boys are pretty sure will endanger some of the colonists. With most communications under the control of their enemies, the only way to get to word to their families is in person but the school on the far side of thousands of miles frozen wilderness from South Colony. Even if they survive the journey, the boys’ problems will only be starting. This moves along nicely and despite the low page count Heinlein still manages to fit a fairly diverse assortment of set pieces: the trek across the Martian wilderness, the Martian city, the uprising against the Company, the unexpected complication with the Martians and so on. I recall that Heinlein got some push-back from his editor over having all the boys run around with pistols. Having that at the back of my mind made me notice something that would have been much easier to check if there was an ebook of this (which there does not seem to be): do any of the women get to carry guns or is this fundamental signal of adulthood restricted to men? I may have missed any pistol-packing mommas in the book but my guess is the answer to my question is “yes, only men get to be true adults.” By this point in his career, Heinlein was still sticking with the “girls are ick and moms are a drag” model; there’s a genially patronizing treatment of the female inability to handle math in a discussion of the air plants that made me idly wonder what that character’s throat would sound like if his wife stuck a knife in it in mid-sneer. I think that the treatment of women changes in the one after the next book and I for one will not miss this model at all all. Better a Girl in Charge than a drip. Speaking of well defined gender roles, it is okay for boys to blub. Jim gets very upset on a number of occasions and nobody thinks the worse of him for it. The unhealthy child in the air crib is an image that must have resonated with Heinlein because it will come back in the next book and not in a good way. It’s interesting to watch the rapid evolution of how Earth is treated in the juveniles. In Rocket Ship Galileo, persistent Nazi problems aside, Earth is pretty good and while the people of Earth might need to be nuked for their own good every once in a while in Space Cadet, the general sense is still of a place someone might be happy to come from. The Earth of Red Planet isn’t anywhere a decent person would want to live and that’s a theme that will come up over and over in this series. The Martian ecology seems pretty diverse and I wondered if this was instead of the Martians or because of them; we know they built the canals and it seems reasonable to speculate that part of the idea was to preserve a diverse ecology (something conservatives would not be reflexively against for about twenty years, and anyway Heinlein hadn’t been entirely Ginnyformed yet). Other issues came up first but I did wonder how the Martians were going to react when the impact of the human O2 plants became obvious and then I wondered if maybe human immigrants are just being handed ecological maintenance problems the Martians cannot be bothered to handle personally any more. A question I’ve had since the last time I reread this concerns MacRae, who in many ways foreshadows those horrible old men who infest later Heinlein. On a number of occasions MacRae seems to have a deeper body of knowledge than he is willing to admit to and at times he loses track of exactly how old he is supposed to be. Now, there’s another class of character that that has comparable issues and that’s the Martian Old Ones, who are somewhat unstuck from time and sometimes become confused over which geological era they are in. Is MacRae an Old One come back in time to orchestrate the treaty between Martians and humans? Is he a human analog of an Old One? Is he, and I really hate to put this out there, a very early draft of Valentine Michael Smith as an old man? One part that does not work as well for me as it would have for the intended readers is the whole colonial uprising plot, in part because the American Revolution the plot invokes is presented a little differently north of the US/Canadian border than it is south of it1 but more because Heinlein doesn’t really make the case that what the Company is doing is wrong. I mean, the implementation is ham-fisted and seemingly designed to piss off the colonists but there are only five hundred and nine colonists in South Colony and their conviction that Mars is theirs seems premature at best. Speaking of “premature at best”, I wonder how well the human economy on Mars works once the shackles of the Company are cast off? But this could have the beneficial effect of encouraging the human integration into Martian society and really, as immigrants shouldn’t they conform to their new homeland’s ways? What does reasonable accommodation consist of in this case? I don’t regret rereading this, although I believe better books are to come in the juvenile series. I don’t think what I am getting out of this is exactly what Heinlein intended but I am not the target market and at least I got something. When looking for an ebook of this I was once again struck by how irregularly the Heinlein juveniles are treated these days. When I bought my MMPKs of the juveniles, the whole line or at least most of it2 was available in mass market from Ace and I expected that Baen would have snapped up the rights. That’s not true at all: the rights to the juveniles seems to be scattered between a few publishers. What I found was the usual Virginia Edition version; if there is an inexpensive MMPK or ebook edition currently available, I missed it. The impression I am left with is of a series now interesting only to a handful of the old and nostalgic. Up here, it was a violent conspiracy by wealthy Americans, mostly slave-owners, to dodge taxes while stealing their UEL neighbors’ property. The exception was Starman Jones, which was from Ballantine for some reason.